Leslie grew up in Green Lake, Wisconsin with horses right in her backyard. By the age of three, she was showing at local shows and by eight she had competed at her first event on her pinto pony Sunrise. That was all it took for the eventing addiction to take hold.Leslie started on her path to a successful eventing career riding Hopscotch, her homebred, 15.2HH, Anglo-Arab, gelding. With guidance from Lois Hyerdahl, Ralph Hill, and Anne Jennings, Leslie set and achieved many goals with Hopscotch. As a pair they represented the Area IV two- star team three times at the Young Rider Championships. Hopscotch and Leslie went on to compete at the Advanced level with top placings at the Wayne and Millbrook Horse Trials. While living in Wisconsin Leslie ran her own lesson and training facility, Hawthorne Ridge. During this time she trained with Jeff Steer and Lucinda Green. Leslie also developed an active young rider and adult amateur program that produced many talented horse and rider combinations. She is quite well known for starting and producing quiet, rideable horses. In 2003 Leslie made the move to Bluemont, Virginia. It was time for a change and Paul offered her the chance to try something new at Champagne Wishes. Her move from the mid-west took a bit of an adjustment period but she has found her niche. Leslie did the majority of the riding and training for the clients and takes pride in her ability to get the most out of each individual horse, even when their talent may not be so readily apparent. Since arriving on the east coast, Leslie has been riding at the Advanced level on her two horses Sara and Brio. 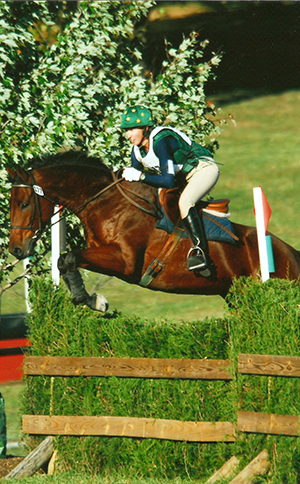 Both horses were untrained prospects, that Leslie found and brought along, qualifying both for CCI*** in 2006. Leslie has trained numerous horses through the levels including Sara, Brio, and Rafiki to the Advanced level; Merlin to the Intermediate level; and Kermit, Koele, Court Jester, Balou, and Foreign Intrigue to the Prelim level. Celie is moving better than ever. 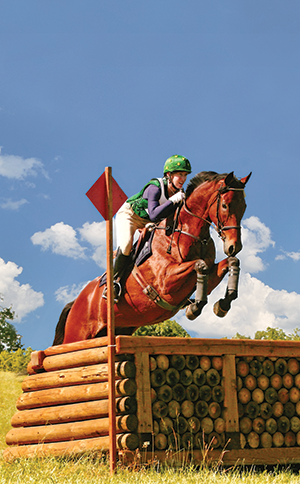 As a competitive event horse, SoundHorse Viscosity allows her to perform at her best even as her work intensifies! This past Fall I had a young horse have an extremely violent trailer accident. He had severe lacerations that required stitches and was banged up from head to toe. Bute was not an option for his pain and inflammation so I put him on Herbsmiths Acute Trauma with amazing results. He should have been crippled from his incident. Instead he had very little swelling where he should have been blown up and he had almost no pain or stiffness. My upper level event horse is extremely hard on her feet and sore heels are a constant threat. However, after putting her on Herbsmiths Heel Relief her heels have calmed down and she is much happier in her work.